The two aspects of the problem, then, are (1) why was Chu Hsi willing to transparently try to explain away Chou Tun-i's evident debts to Taoism, and (2) why was he so intent on declaring Chou to be the first Confucian sage since Mencius? I will argue that a fuller understanding Chou Tun-i's use of Taoist and possibly Buddhist categories is the key to his significance for Chu Hsi. I will further argue that this understanding of Chu Hsi's appropriation of Chou Tun-i leads to a useful reinterpretation of some of Chu Hsi's central concepts. More specifically, I will propose that the key to Chu Hsi's evaluation of Chou Tun-i - and to his interpretation of t'ai-chi, which in this context should be translated as "Supreme Polarity" - can be found in Chou Tun-i's concept of the interpenetration of activity and stillness (tung-ching) under the rubric of the yin-yang polarity. This concept provided Chu with philosophical grounding for his solution to the major issue he grappled with during the 1160s, the problem of the cultivation of the mind. His solution to this problem constituted the major turning point in Chu's philosophical career. Significantly, it was just after this breakthrough that Chu began his commentaries on Chou Tun-i's works. It was similarly difficult for Chu Hsi to ignore Chou Tun-i's debts to Taoism, despite the fact that these were not well-documented. The prevailing view concerning the T'ai-chi Diagram, in Chu Hsi's time as now, had been formulated by Chu Chen (1072-1138), who died eight years after Chu Hsi was born. He had traced the Diagram to the famous T'ang dynasty Taoist priest, Ch'en T'uan (10th century), from whom it was passed to Ch'ung Fang (d. 1015), then to Mu Hsiu (d. 1032), and then to Chou Tun-i. (4) Ch'en T'uan had also been identified as the ultimate source of the "learning of the Classic of Change" (I-hsüeh) among the Sung Neo-Confucians by the followers of Shao Yung (1011-1077). (5) I-hsüeh was understood to include not only the T'ai-chi Diagram but also the use of the appendices of the I as a source of moral and cosmological insight. Chou Tun-i's major writings, the short "Explanation of the T'ai-chi Diagram" and the longer T'ung-shu (or I-t'ung, "Penetrating the Classic of Change"), are two of the early Sung examples of this trend toward giving the I-ching a central role among the textual sources of the Neo-Confucian revival. Another possible inspiration for Chou's diagram, or at least part of it, may be the diagram depicting the gradations of Buddhist enlightenment attributed to Tsung-mi (780-841). The dating of this too has been questioned, and the suggestion made that it is a later addition to Tsung Mi's work. (9) In any case, the only part of Chou's diagram that it resembles is the circle composed of alternating black and white half-rings, which evolved into the familiar yin-yang diagram seen everywhere today. But beyond the possible design influence, there are other possible Buddhist influences on Chou's thought -- and through him, on Chu Hsi's - to which I will return later. Despite what may be the impossibility of pinning down a precursor to the T'ai-chi t'u, it is nevertheless difficult to believe that Chou Tun-i constructed it out of whole cloth. The most telling objection to such a suggestion is the fact that in his Explanation, Chou does not explain all the parts of the diagram - e.g. the two large circles at the bottom, and the small circle connecting the phases of fire, water, wood, and metal in the middle. One would expect him to fully explain a diagram that he had created. Yet we know that these elements of the diagram were interpreted by nei-tan Taoists at least in the Sung dynasty. (10) So, whether or not its pedigree extended back to Ch'en T'uan, and whether or not the nearly identical T'ai-chi hsien-t'ien t'u and Wu-chi t'u date back prior to the Sung, it seems most reasonable to assume that Chou Tun-i received the T'ai-chi t'u, either directly or indirectly, from some Taoist practitioner(s). It also seems reasonable to assume that he was aware of the Taoist use and interpretation of the Diagram. Chou's T'ai-chi-t'u shuo (Explanation of the T'ai-chi Diagram) has engendered controversy and debate ever since the twelfth century, when Chu Hsi and Lü Tsu-ch'ien (1137-1181) placed it at the head of their Neo-Confucian anthology, Reflections on Things at Hand (Chin-ssu lu), in 1175. A decade later it was the subject of the exchange of letters by Chu and the Lu brothers, mentioned above, and in fact scholars to the present day have attempted to interpret what Chou Tun-i meant by the key terms wu-chi and t'ai-chi. Non-polar and yet Supreme Polarity (wu-chi erh t'ai-chi)! (13) Supreme Polarity in activity generates yang; yet at the limit of activity it is still. In stillness it generates yin; yet at the limit of stillness it is also active. Activity and stillness alternate; each is the basis of the other. In distinguishing yin and yang, the Two Modes are thereby established. Of the two terms, wu-chi had the stronger and more exclusively Taoist associations, appearing in the classical Taoist texts, Lao Tzu (chapter 28), Chuang Tzu (chapter 6), and Lieh Tzu (chapter 5). Wu is a negation, roughly equivalent to "there is not;" chi is literally the ridgepole of a peaked roof, and usually means "limit" or "ultimate." So in these early texts wu-chi means "the unlimited," or "the infinite." In later Taoist texts it came to denote a state of primordial chaos, prior to the differentiation of yin and yang, and sometimes equivalent to tao. This more developed sense is consistent with its usage in Lao Tzu 28(21), and with the more general sense of wu in Lao Tzu as the state of "non-existence" that precedes "existence" (yu, e.g. ch. 40) and/or is interdependent with it (ch. 2). T'ai-chi was found in several classical texts, mostly but not exclusively Taoist. For the Sung Neo-Confucians, the locus classicus of t'ai-chi was the Appended Remarks (Hsi-tz'u), or Great Treatise (Ta-chuan), one of the appendices of the I-ching: "In change there is T'ai-chi, which generates the Two Modes [yin and yang]" (A.11.5). T'ai-chi here is the source of the yin-yang principle of bipolarity, and is contained or inherent in the universal process of change and transformation. Thus, in the major Confucian source of the term t'ai-chi (i.e. the Hsi-tz'u), and in the whole complex of Taoist ideas surrounding both wu-chi and t'ai-chi, the notion of polarity, based of course on the word chi, is quite prominent. Even in the colloquial usage of chi as "very" or "ultimate," the idea of the end point or extremity in a cyclical (or alternating) process carries at least the potential connotation of polarity. Since the yin-yang model does not shape our thinking as much as it did the Sung Confucians', we may be mistaken in interpreting such ideas as "end point" and "extreme" according to a linear model. The Five Phases are simply yin and yang; yin and yang are simply the Supreme Polarity; the Supreme Polarity is fundamentally non-polar. Just as the Five Phases are a further developmental stage or unfolding of yin and yang, so too yin and yang are the natural expression of bipolarity, and bipolarity itself is an integral, unified concept. The direct equation of yin and yang with t'ai-chi here is, of course, noteworthy. So, while the polarity model works well with these passages, there is not a very large body of Chou Tun-i's writings on which to test it. Nevertheless, it clarifies some difficulties and sheds some light on the overall picture. Chu Hsi's case, though, is quite different. Here we have not only a much larger written corpus, but a thoroughly worked-out system in which t'ai-chi places a central role, in part through its identification with li (order, principle). (24) My hypothesis, in brief, is that Chu Hsi understood t'ai-chi to be the most fundamental cosmic ordering principle, which is, to be specific, the principle of yin-yang polarity. That is, the simplest, most basic ordering principle in the Chinese cosmos is the differentiation of unity into bipolarity (not duality). Wu-chi erh t'ai-chi, then, means that this most fundamental principle, bipolarity - despite its evident "twoness" and its role as the ultimate source of multiplicity - is itself, as a rational ordering principle, essentially undifferentiated. And since any concrete instance of differentiation or polarity embodies this integral, non-polar principle, the two - non-polarity and ultimate polarity - themselves have a non-dual relationship. Hence every concrete thing embodies both polarity (as its order or pattern) and non-polarity (as the principle of that order), or differentiation and undifferentiation, or multiplicity and unity. The operation of Heaven above has neither sound nor smell,"(27) and yet it is the pivot (shu-niu) of the actual process of creation and the basis of the classification of things. Thus it says, "Non-polar and yet Supreme Polarity!" It is not that there is non-polarity outside of the supreme polarity. [Chou:] The two [modes of] ch'i and the Five Phases transform and generate the myriad things. The five are the differentia (shu) and the two are the actualities (shih); the two are fundamentally one. Thus the many are one, and the one actuality is divided into the many. Each one of the many is correct; the small and the large are distinct. To conclude thus far: I have tried to show that the best way to interpret wu-chi and t'ai-chi in both Chou Tun-i's and Chu Hsi's writings is by means of a model of polarity. The model is based on the literal or original meaning of the word chi, while the argument is based on the usage of the terms by both figures. Furthermore, this interpretation clarifies Chu Hsi's central concept of li, which in the most general sense is order per se, and in more specific senses refers to particular principles. The most basic of these principles is that of yin/yang bipolarity, called "Supreme Polarity,"(36) which in its simplest manifestation takes form as activity and stillness (tung-ching), as in Chou's philosophical cosmogony. If Chu Hsi had simply wanted to use t'ai-chi to express the idea of the ultimate (or "supreme") polarity, he could easily have limited himself to the Hsi-tz'u appendix of the I-ching, whose Confucian authority was unquestioned (even if Confucius himself did not write it, as Ou-yang Hsiu argued). In this way he could have avoided the unpleasantness of relying so strongly on Chou Tun-i, with his dubious Taoist connections. The reason why Chu could not do without Chou was Chou's elaboration of polarity in terms of the unquestionably Taoist concept of wu-chi. I would propose that it was the relationship of wu-chi and t'ai-chi, and the extension of that model to activity and stillness, that captured Chu's imagination and helped him work out the major intellectual crisis of his career. Non-polar and yet Supreme Polarity (wu-chi erh t'ai-chi)! Supreme Polarity in activity generates yang; yet at the limit of activity it is still. In stillness it generates yin; yet at the limit of stillness it is also active. Activity and stillness alternate; each is the basis of the other. In distinguishing yin and yang, the Two Modes are thereby established. Activity as the absence of stillness and stillness as the absence of activity characterize things (wu). Activity that is not [empirically] active and stillness that is not [empirically] still characterize spirit (shen). Being active and yet not active, still and yet not still, does not mean that [spirit] is neither active nor still. [Chu's comment: There is stillness within activity, and activity within stillness.] For while things do not [inter-]penetrate (t'ung),(37) spirit subtly [penetrates] the myriad things. The issue was the relationship of the still and active phases of mind, and Chu was involved in debate on it from 1158 to 1169. (46) The significance of the issue was its relevance to methods of self-cultivation, but there was a prior philosophical issue, namely: Is it possible for the mind, as an experiential, psycho-physical agent, to apprehend or to experience a state of total stillness? For Chu Hsi the answer was categorically negative. This was because he took seriously the claim that mind is an empirical thing, a form of ch'i. Since ch'i is inherently dynamic, by definition it cannot be totally still. What is still -- also by definition -- is the abstract principle (li) of the mind (or hsing, human nature). Chu Hsi's description of Ch'an meditation, like his accounts of Buddhist doctrines, is a caricature. His own instruction for quiet-sitting (which is actually rather Ch'an-like) situates it in the context of responsiveness to the ongoing flow of events. This should be continued even when the mind is in a relatively still phase, for total stillness is neither possible nor desirable as an experienced state. In this way quiet-sitting was conceptually adapted to traditional Confucian "activism," to the philosophy of change -- the alternation of activity and stillness -- as expressed in the I-ching, and to Chou Tun-i's notion of the metaphysical interpenetration of activity and stillness. Quiet-sitting was thus distinguished from the meditation practiced by Buddhists, who allegedly placed higher value on inactivity and complete emptiness of mind than on active engagement in ordinary affairs. The problem for Chu Hsi was to discover a way of experiencing this doctrine as it applied to the mind -- a way of putting the doctrine into practice. In terms of the practice of self-cultivation, Chu found his solution in Ch'eng I's idea that "the effort to maintain 'reverent composure' (ching) joins the states of activity and stillness at their point of intersection. "(55) Ching functioned as a unifying concept, providing an attitudinal (not philosophical) foundation for self-cultivation. One could not actually experience perfect stillness while engaging in worldly activity, but one could experience a form of composure that would comprehend stillness and activity and allow for the possibility of orienting both phases, as a coherent whole, according to moral principle. Ching, in other words, is an experiential, attitudinal analogue to t'ai-chi and li, comprehending stillness and activity just as li comprehends yin and yang. [Someone asked:] "Can Sagehood be learned?" "I beg to hear them." Chu Hsi claims that what Chou Tun-i meant here by "desirelessness" is the same as what Ch'eng I meant by ching or reverent composure -- thus redefining in Confucian terms a proposition with obvious Buddhist resonances(59) -- because both terms were defined in terms of unity or unification. Chu discusses two senses of "unity" here. In metaphysical terms, he identifies unity with the Supreme Polarity inherent in the mind. (60) In terms of self-cultivation, he says that both Chou and Ch'eng interpret "unity" of mind as a "clear-sighted unity, not a muddle-headed unity," and not "lumping everything together. "(61) It is neither concentration on one thing to the exclusion of all else, nor concentration on unity and neglect of diversity. Chu Hsi considered the state of mind described by the terms "unity" and "reverent composure" to be the spiritual basis of both the intellectual cultivation of mind and moral activity. It is a state of composure that remains unchanged by external stimuli and yet enables one to respond to them -- a state of fluid responsiveness. (62) This condition is independent of the mind's content or activity at any particular moment. In the absence of stimuli the mind characterized by reverent composure is equable and poised; when stimulated it responds immediately, because it is not preoccupied with private motivations or with fixed concentration. Since it is not preoccupied with anything it cannot be disturbed. Ching provides an experiential, unchanging ground or orientation for mental activity. Thus the quality of the mind in its still phase determines the quality of its activity -- in particular its capacity for "directness in activity" or immediate, intuitive response to changing events. The purpose of "emphasizing stillness"is to "nourish activity. "(65) In this way Chu Hsi, with the help of Ch'eng I, "saves" Chou Tun-i from Taoist and Buddhist quietism and establishes a Confucian quietism that fundamentally entails activity. This he is able to do on the basis of Chou's own idea of the interpenetration of activity and stillness. Chu Hsi found in Chou Tun-i's concept of the interpenetration of activity and stillness a philosophical grounding for the central method of self-cultivation that he developed, which was a middle ground between the "quietistic" application of Chou's thought he had learned from his teacher, Li T'ung, and the emphasis on activity and the active, expressed mind that was taught by the Hu school, which for awhile Chu found attractive. His emphasis on the non-duality of activity and stillness, or what I am calling their interpenetration, is abundantly evident in his comments on Chou's texts. What is lacking, of course, is a smoking gun: an explicit statement to the effect that this is the reason for his interest in Chou Tun-i. What I have offerred here is essentially a reading of the texts that supports this hypothesis, but I admit that it must remain an interpretive reading - at least until a smoking gun is found. On the other hand, given the way in which Chu installed Chou in the "succession of the Way" (tao-t'ung),(66) it might have been counter-productive for him to admit that Chou was in effect serving a purpose. Chu was a great myth-maker, and Chou played an absolutely central role in the story or myth of the tao-t'ung. As I have argued elsewhere, Chou symbolized the "born Sage," the uniquely-endowed person who could apprehend the Tao "with his mind alone," without reading it in texts or hearing it from a teacher. (67) In this way Chou symbolized for the Tao-hsüeh movement the possibility of access to the ultimate truth of the Tao by independent scholars (such as many of them), outside the traditional channel of legitimation represented by the Emperor and the Mandate of Heaven. I have glossed over here some of the Buddhist implications that are evident in Chou's writing (such as the idea of eliminating desire), of which Chu Hsi was certainly aware. In fact, it is beyond question that the entire revival of Confucianism in the Sung -- including both the Ch'eng-Chu school and its competitors -- was influenced by Buddhism in very significant ways, e.g. the emphasis on theories of mind, the practice of meditation or "quiet-sitting" (ching-tso), the genre of the "Recorded Sayings" (Yü-lu), etc. Chu Hsi occasionally used terms that had technical, specialized uses in Buddhism; one example is his use of the term "non-obstruction" (wu fang-ai) -- basically synonymous with "interpenetration" -- in reference to the relationship between wu-chi and t'ai-chi. (68) This is very close to a key doctrine in Hua-yen Buddhism: the mutual non-obstruction of principle and phenomenon (li-shih wu-ai) and the mutual non-obstruction of phenomenon and phenomenon (shih-shih wu-ai). This means that since all phenomena are empty of "own-being," therefore each fully manifests the ultimate principle (namely emptiness), and thus each thing fully contains the reality of every other thing (the principle of emptiness); hence their mutual "non-obstruction." The formal structure of this argument is basically the same as the argument I have outlined here for the interpenetration of activity and stillness. The tradition that we call Neo-Confucianism developed in dialogue not only with Sung Taoism and Buddhism, but with popular religion too. We need to take care not to become attached too strongly to the convenient categories that we have long used to interpret the mélange of Chinese religious ideas and practices. 1. See Hoyt Cleveland Tillman, Confucian Discourse and Chu Hsi's Ascendancy (Honolulu: University of Hawaii Press, 1992), especially ch. 9. 2. In an earlier, unpublished paper, I dealt more extensively with the background of this problem in terms of Chu's concept of the "succession of the Way" (tao-t'ung). While the background is relevant here too, I will not duplicate it. The argument of that paper was that Chou Tun-i's linkage of metaphysics and cosmology in the T'ai-chi-t'u shuo and his linkage of metaphysics and ethics or moral psychology in the T'ung-shu (Penetrating the Changes) provided, for Chu Hsi, a systematic vocabulary by which moral self-cultivation could be integrated with his metaphysical system, based on the concepts of li (order or principle) and ch'i (psycho-physical stuff). See Joseph A. Adler, "The Mind of the Sage: Chu Hsi's Appropriation of Chou Tun-i" (presented to Association for Asian Studies Annual Meeting, Washington D.C., April, 1992). The present paper is a further development along those lines, with a more specific hypothesis. 3. Chu claimed that the T'ai-chi Diagram and its Explanation were esoteric teachings that Chou had revealed to the Ch'eng brothers, which they were unwilling to share with their own students. Other problematic aspects of Chu's appropriation of Chou are reviewed in my above-mentioned paper, and in A.C. Graham, Two Chinese Philosophers (1958; rpt. LaSalle: Open Court, 1992), appendix II. 4. Note that Mu died when Chou was fifteen years old, which may or may not cast doubt on the possibility of this transmission. They were living in the same city at the time, and the picture of an old master passing on an esoteric diagram to a bright young man who may have been sixteen sui at the time is certainly plausible. For a thorough discussion of these problems see Bounghown Kim, A Study of Chou Tun-i's (1017-1073) Thought (Ph.D. diss., University of Arizona, 1996). On the point in question here, see pp. 101-102. Chu Chen's theory is found in his Han-shang I-chuan (Han-shang's Commentary on the Changes). 6. It is found in Shang-fang ta-tung chen-yüan miao-ching t'u (Tao-tsang, vol. 196). Fung Yu-lan, in A History of Chinese Philosophy, vol. 2, pp. , supports the connection between the two charts, while A.C. Graham, in Two Chinese Philosophers, pp. 171-172, discounts it. 7. See Kim, op. cit., pp. 118-124. 9. See Kim, op. cit., pp. 157-160. 11. Readers are probably familiar with the more common translations, including "The Ultimate of Non-being and also the Great Ultimate" (Wing-tsit Chan, A Source Book in Chinese Philosophy [Princeton University Press, 1963], p. 463), "The Ultimateless! And yet also the Supreme Ultimate!" (Derk Bodde's translation of Fung Yu-lan, A History of Chinese Philosophy, v. 2 [Princeton University Press, 1953], p. 435), and "It is the ultimate of nothing which is the Supreme Ultimate" (A.C. Graham, op.cit, p. 156). My translation is closest to Joseph Needham's, "That which has no pole and yet (itself) the Supreme Pole" (Science and Civilisation in China, v. 2 [Cambridge University Press, 1956], p. 460). Needham's, however, concretizes the two terms in such a way as to miss the point that they refer to patterns or principles, not things. While Chou Tun-i is ambivalent, or rather noncommittal, on this distincion, Chu Hsi is very clear. 12. Chou Lien-hsi chi, 1:2a. 13. Since erh can mean "and also," "and yet," or "under these circumstances," the precise meaning of the line is far from clear. This reading -- or perhaps: "The non-polar Ultimate Polarity!" - gives erh the same function it evidently has in the rest of the paragraph (something like "under these circumstances"). 14. In other words: seen as a whole system, the Five Phases are based on the yin-yang polarity; the yin-yang polarity is the Supreme Polarity; and the Supreme Polarity is fundamentally Non-polar. However, taken individually as temporal phases, the Five Phases each have their own natures (as do yin and yang). 15. I-ching (Classic of Change), Hsi-tz'u (Appended Remarks), A.1.4. Chu Hsi, Chou-i pen-i (The Original Meaning of the Classic of Change) (1177; rpt. Taipei: Hualian, 1978), 3:1b. Ch'ien and K'un are the first two hexagrams, symbolizing pure yang and pure yin, or Heaven and Earth, respectively. 16. Paraphrasing I-ching, T'uan commentary to hexagram 31 (Hsien): "The two ch'i stimulate and respond in mutual influence, the male going beneath the female.... Heaven and Earth are stimulated and the myriad things are transformed and generated" (Chou-i pen-i, 2:1a-b). 17. Cf. Hsi-tz'u A.5.6, "Generation and regeneration are what is meant by i (change)" (Chou-i pen-i, 3:6a). 18. I am not claiming that Chou wrote the T'ung-shu after the T'ai-chi-t'u shuo, for indeed there is nothing known about when he wrote either text, and suggestions have occasionally been made that he did not write the Explanation at all. Nevertheless, there are extremely significant overlaps and consistencies between the two, and logically, if not historically, it is fair to say that the T'ung-shu is a further development of the T'ai-chi-t'u shuo. 19. Not even Chu Hsi entirely ruled out the possibility that Chou was influenced by Taoist ideas, and Chou does betray familiarity with Taoist texts and speaks admiringly of Ch'en T'uan in some of his poetry. See Kim, op. cit., pp. 55-58, 74-75. 20. The following summary of Taoist ideas is based primarily on Isabelle Robinet, "The Place and Meaning of the Notion of Taiji in Taoist Sources Prior to the Ming Dynasty," History of Religions, 23, no. 4 (1990), pp. 373-411. 21. "Being the model for the world, he will never deviate from eternal virtue, but will return to the state of the infinite." Trans. Chan, op. cit., p. 154, substituting "infinite" for "Ultimate of Non-being." 23. Also, I have never really understood what "Supreme Ultimate" could mean, as ultimacy would appear by definition to be non-qualifiable. 24. Although Yu Yamanoi argues that T'ai-chi is "an alien element in Chu Hsi's theoretical system" ("The Great Ultimate and Heaven in Chu Hsi's Philosophy," in Wing-tsit Chan, ed., Chu Hsi and Neo-Confucianism [Honolulu: University of Hawaii Press, 1986], p. 86), I take my argument here to be a refutation of his. 25. I was first led to this observation by finding, in earlier research, that Chu Hsi's commentary on the I-ching is almost entirely based on his attempt to retrieve the yin-yang meanings of the original lines of the hexagrams, which had for centuries been buried under multiple layers of numerological and socio-ethical interpretations. I had found that Chu Hsi, the moralistic and devoted follower of Ch'eng I, had harshly criticized Ch'eng for ignoring this basic level of meaning in the I and imposing his own - albeit entirely excellent and praiseworthy - socio-ethical meanings on the text. See Kidder Smith, Jr., Peter K. Bol, Joseph A. Adler, and Don J. Wyatt, Sung Dynasty Uses of the I Ching (Princeton: Princeton University Press, 1990), ch. 6. 26. These comments are drawn both from his published commentaries on Chou's two main texts, and from his Classified Conversations (the Chu Tzu yü-lei). Both are found, compiled together, in Chang Po-hsing, comp., Chou Lien-hsi hsien-sheng ch'üan-chi (1708), contained in his Cheng-i t'ang ch'üan-shu (Library of Cheng-i Hall, Pai-pu ts'ung-shu chi-ch'eng edition, hereafter cited as Chou Lien-hsi chi. The sources of the statements taken from the Chu Tzu yü-lei will be tracked down later. 27. Chung-yung 33 (last line), quoting Shih-ching, no. 235. 28. See Chan, op. cit., p. 183, and Wang Hsien-ch'ien, comp., Chuang Tzu chi-chieh (Taipei: Taiwan Commercial Press, 1980), p. 10. 29. Chou Lien-hsi chi, 1:7b. 30. Quoted from I-ching, Hsi-tz'u A.5.1. 31. Chou Lien-hsi chi, 5:3a. 32. Chou Lien-hsi chi, 5:5b. 33. Chou Lien-hsi chi, 1:8a. 34. Chou Lien-hsi chi, 6:11a. 36. "Ultimate Polarity" would be a better expression, since what it really means is polarity per se. But this might be confusing, since chi is more commonly translated as "ultimate." 37. I.e. they are limited by their physical forms. 38. Chou Lien-hsi chi, 5:33b-34b. 39. Chou Lien-hsi chi, 1:5b. 40. Chou Lien-hsi chi, 1:7b. 42. Chou Lien-hsi chi, 1:12a. 43. Chou Lien-hsi chi, 5:34b. 44. Chou Lien-hsi chi, 5:35a. 45. For a recent, brief discussion, see Rodney L. Taylor, "Chu Hsi and Meditation," in Irene Bloom and Joshua A. Fogel, Meeting of Minds: Intellectual and Religious Interaction in East Asian Traditions of Thought (New York: Columbia University Press, 1997), pp. 43-74, esp. pp. 46-49. 46. It was also stated in terms of "equilibrium and harmony" (chung-ho), from the Chung-yung. 47. Hu Hung, interestingly, had also championed Chou Tun-i, and it was probably through Chu Hsi's close relations with the Hu school that he came to appreciate Chou. See Hu Hung's Preface to Chou's T'ung-shu in Chou Lien-hsi chi, 7:1b-2b. Hu's commentary is no longer extant. 48. See Chu's letter to Chang, in Chu Wen-kung wen-chi (Chu Hsi's Collected Papers, Ssu-pu pei-yao ed. ), 30:19a-b, and Ch'ien Mu, Chu Tzu hsin hsüeh-an (A New Scholarly Record of Chu Hsi) (Taipei: San-min, 1971), v.2, pp. 130-134. 49. Chan, Source Book, p. 602. 50. In the T'ai-chi-t'u shuo, Chou says: "The Sage settles these [affairs] with centrality, correctness, humaneness and rightness (the Way of the Sage is simply humaneness, rightness, centrality and correctness) and emphasizes stillness. (Without desire, [he is] therefore still.) In so doing he establishes the ultimate of humanity." The parenthetical comments are Chou's own. 51. See Okada Takehiko, Zazen to seiza (Tokyo: Ofusha, 1966), and Rodney L. Taylor, The Confucian Way of Contemplation: Okada Takehiko and the Tradition of Quiet-sitting (Columbia: University of South Carolina Press, 1988). 52. Chu Tzu yü-lei (Chu Hsi's Classified Conversations), comp. Li Ching-te (1270; rpt. Taipei: Cheng-chung, 1962; 3rd printing, 1970), ch. 12, pp. 345-346. 53. See Chu Tzu yü-lei, ch. 1, pp. 3-4. 54. I-ch'üan I-chuan (Ch'eng I's Commentary on the Classic of Change) (Ts'ung-shu chi-ch'eng ed. ), Preface, p. 2. 55. Trans. Thomas Metzger, Escape from Predicament: Neo-Confucianism and China's Evolving Political Culture (New York: Columbia University Press, 1977) , p. 98, slightly modified. For more on ching see Graham, Two Chinese Philosophers, pp. 67-73, and Chan, Source Book, pp. 522, 547, 593, 785. See also Chu Tzu yü-lei 12, p. 338; Ch'ien Mu, op. cit., v.2, pp. 298-335; and Yoshikawa Kojiro and Miura Kunio, Shushi shu (Tokyo: Asahi Shinbun Sha, 1972), pp. 115-119. 56. Chu Wen-kung wen-chi, 64:29a, trans. Chan, Source Book, p. 601, with "reverent composure" substituted for "seriousness." I use "reverent composure" to convey both the religious connotations of the word (in older texts it referred to the proper attitude with which one approaches gods and spirits) and the sense of focused attention that the Neo-Confucians give to the word. 57. Ho-nan Ch'eng-shih i-shu (Kuo-hsüeh chi-pen ts'ung-shu ed. ), p. 223. Cited in Graham, Two Chinese Philosophers, pp. 68-70. 58. Chou Lien-hsi chi, 5:38b. 59. Although Chu Hsi, like the Buddhists, acknowledged the potential for evil (or suffering) in human desire (jen-yü) he taught that desires should be not eliminated but selectively cultivated and trained to accord with the Way. Only selfish desires (ssu-yü) should be eliminated. The basic Buddhist approach was to extinguish desire or "thirst" (tanha). 60. This is in his published commentary ("Unity is Supreme Polarity"). Chou Lien-hsi chi, 5:39a. In his commentary on the first line of section 22 of the T'ung-shu he says, "Were it not for the perfect intelligence of the Supreme Polarity of the human mind, how would one be able to discern it?" Chou Lien-hsi chi, 6:1b. 61. Chou Lien-hsi chi, 5:39b. 62. For a discussion of responsiveness in Neo-Confucian discourse, see Joseph A. Adler, "Response and Responsibility: Chou Tun-i and Neo-Confucian Resources for Environmental Ethics," in Confucianism and Ecology: The Interrelation of Heaven, Earth, and Humans, ed. Mary Evelyn Tucker and John Berthrong (Cambridge: Harvard University Center for the Study of World Religions, 1998). 63. Chou Lien-hsi chi, 5:40a, statement by a student to Chu Hsi, with which he agrees. 64. Ibid., part of Chu Hsi's response to the above statement. 65. 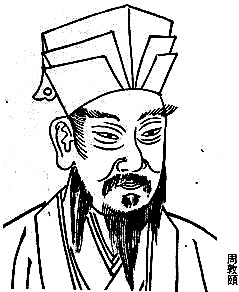 Chu Tzu yü-lei, ch. 71, p .2855. 66. See my earlier paper, "The Mind of the Sage: Chu Hsi's Appropriation of Chou Tun-i." 67. Ibid. Chu was sometimes ambivalent about this, though, and occasionally admitted that Chou must have studied with someone. Perhaps, though, he would say that of course Chou had teachers, but he did not necessarily "hear the Way" from them. See, for example, Chou Lien-hsi chi, 5:16a. 68. "'Non-polar, yet Supreme Polarity' explains existence [polarity or differentiation] within non-existence [non-polarity or undifferentiation]. If you can truly see it, it explains existence and non-existence, first one, then the other (huo hsien huo hou), neither obstructing the other (tou wu fang-ai)" (Chou Lien-hsi chi, 1:6a). The temporality in the second sentence is perplexing, given that the first sentence seems to refer to simultaneous interpenetration. Perhaps hsien and hou are not temporal terms, but something like "foreground and background." In any case, Chu's use of the term "non-obstruction" in this context is very close to the Buddhist concept. 69. See, e.g., Robert M. Gimello, "Marga and Culture: Learning, Letters, and Liberation in Northern Sung Ch'an," in Robert E. Buswell, Jr., and Robert M. Gimello, Paths to Liberation: The Marga and its Transformations in Buddhist Thought (Honolulu: University of Hawaii Press, 1992), pp. 371-437. 70. See Kim, op. cit., pp. 144-145.